Announced in an official blog post, Google rolled out the 11th annual version of the Google Zeitgeist earlier today. The Zeitgeist shows off the search terms that grew the fastest during the year as well as the most popular terms in various countries around the world. In the Fastest Rising category, YouTube star Rebecca Black took the top spot this year in regards to Google searches, both globally and within the United States. Black beat out Jackass star Ryan Dunn, Casey Anthony as well as Steve Jobs. 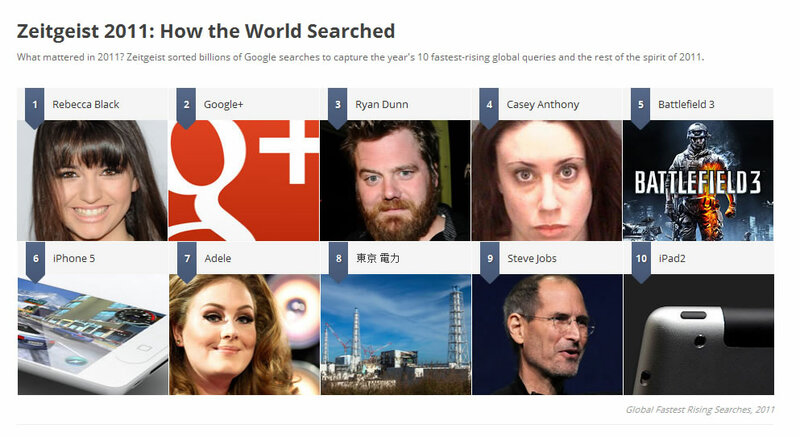 She also topped Google Plus, Battlefield 3, iPhone 5, professional singer Adele and the iPad 2. Alternatively, a few terms on the fastest falling list include Myspace, social gaming site Hi5, Hotmail and Delta Airlines. The Zeitgeist also breaks down terms into a variety of categories at the global level including food and drink, Google Maps, consumer electronics, sports, entertainment and Google News. Further categorization can be found within each countries top terms. On the Food and Drink list, several fast food locations topped the list including Wendys, Little Caesars, Chick Fil A and Popeyes. Recipe site Allrecipes also seemed to be a dominant term in addition to the term cupcakes. When searching on Google Maps within the United States, popular terms included airport, casinos, veterinarian, laundromat and Mexican restaurants. Businesses that made that list included Wells Fargo, Starbucks and Ikea. Amazon’s Kindle Fire beat out all other consumer electronic products to become the top term for global searches. The iPhone 4S took the number two spot and other Apple products on that list include the iPad 2 and the unreleased iPad 3. Other popular terms within the consumer electronics category included Sidekick 4G, HP Touchpad, HTC Sensation, Samsung Nexus Prime and the Sony NPG. Specific to the United States, Apple dominated searches with 8 out of the top 10 results in the technology category; only the terms Touchpad and Toshiba Tablet made it into the top ten.